Florence Freer came to Cornell after acting as a field extension worker in Otsego County. Her exemplary organization and program work with the Home Bureau enabled her to become the head of county home demonstration agents in 1918. The following year she helped Helen Canon restructure home demonstrations, and became the state leader of home demonstration agents. 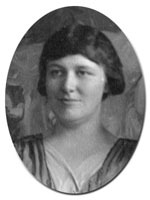 Freer left Cornell in 1920 to continue doing fieldwork as the home demonstration agent for the city of Rochester, a position she maintained through 1924.